Gavvalu: Gavvalu is one of the typical sweets made in Andhra Pradesh, and is a mixture (dough) of rice flour, all purpose flour and water or milk. The prepared dough is shaped into small rounds, which are flattened and rolled (on a special tool) so as to take the shape of gavvalu (cowrie shells). These shells are fried in oil or ghee and can be set aside for some time until the diners are ready to eat them. When eaten, these shells are poured into sugar or jaggery syrup. Mix all purpose flour, rice flour and ghee in a mixing bowl. Add water little by little to prepare non – sticky dough. Cover the dough with a lid or a wet cloth and leave it for 20 minutes. Make 35-40 equal marble sized balls with the dough. Holding the Gavvala peeta with your left hand, take a dough ball and press it on the gavvala peeta with your thumb finger, to get impressions. Roll the flattened dough again with the thumb, to give them the share of gavvalu. Prepare all the dough balls in the same way. Heat the oil in a heavy pan, on medium flame. 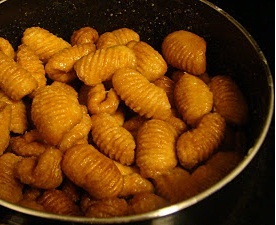 Deep fry the prepared Gavvalu in batches on medium or low heat for around five minutes or till they are golden brown. Drain the oil and transfer them onto a tissue paper to absorb the excess oil. Combine sugar with water and prepare a thick sugar syrup (may be 2 1/2 thread consistency). Add in a pinch of green cardamom powder. Transfer the deep fried Gavvalu to the hot sugar syrup. Spread them on a plate and allow them to cool down, so that the sugar crystallizes and they don’t stick to teach other. Serve gavvalu with a cup of tea / coffee. The gavvalu can be stored in an airtight container for up to 15-20 days.